A harbor (harbour in British English) or haven is a protected body of water that is sufficiently deep to provide ships with shelter from the weather and to store the vessels. Harbors can be natural or artificial. A natural harbor is surrounded on most sides by land, resulting in calmer waves inside the harbor. An artificial harbor usually has sea walls or breakwaters and may require dredging. A port is often built in a harbor, but every harbor does not have a port. A port is a man-made coastal or riverine facility where boats and ships can load and unload passengers and cargo. It may consist of quays, wharfs, jetties, piers, and slipways with cranes or ramps. A port may also have magazine buildings or warehouses for the storage of goods and a transport system, such as railway, road transport, or pipeline transport facilities for relaying goods inland. The largest artificially created harbor is in Rotterdam, The Netherlands. The busiest harbor is the twin Port of Los Angeles and Port of Long Beach in southern California in the United States. 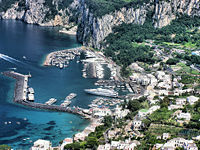 Capri harbor, Italy, seen from Anacapri. A natural harbor in Vizhinjam, India. A natural harbor is a landform where a part of a body of water is protected and deep enough to furnish anchorage. Natural harbors have long been of great strategic and economic importance. 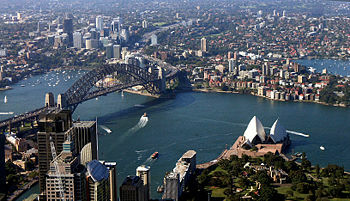 Many of the great cities of the world are located on a natural harbor. Having a naturally protected harbor reduces or eliminates the construction of breakwaters. For harbors near the poles, being ice-free is an important advantage, ideally all-year round. Examples are Murmansk (Russia), Petsamo (Russia, formerly Finland), Hammerfest, Vardø, and Prince Rupert (Canada). The southernmost harbor, at Antarctica's Winter Quarters Bay (77°50′S), presents a potentially ice-free harbor, dependent on summer pack ice conditions. St. John's harbour in Newfoundland, Canada. Sometimes a harbor is needed where one is not available because of damage, as in times of war. In such a case, a temporary harbor may be built and transported in segments to the required location. The most notable of these were the two Mulberry harbors used during the D-Day invasion of Normandy in World War II. A tiny harbor at the village of Clovelly in Devon, England. ↑ National Science Foundation, U.S. Polar Programs. Retrieved September 14, 2008. Dunham, James W., and Arnold A. Finn. 2002. Small-Craft Harbors: Design, Construction, and Operation. Amsterdam: Fredonia Books. ISBN 1589639650. Keith, Robert C. 1991. Baltimore Harbor: A Picture History. Baltimore: Johns Hopkins University Press. ISBN 0801842042. Roland, Alex, W. Jeffrey Bolster, and Alexander Keyssar. 2008. The Way of the Ship: America's Maritime History Reenvisioned, 1600-2000. Hoboken, NJ: John Wiley & Sons. ISBN 978-0470136003. Whiteneck, Lawrence L., and Lester A. Hockney. 1989. Structural Materials for Harbor and Coastal Construction. New York: McGraw-Hill. ISBN 0070681538. Ports of United States of America. PortFocus. This page was last modified on 27 July 2017, at 23:01.